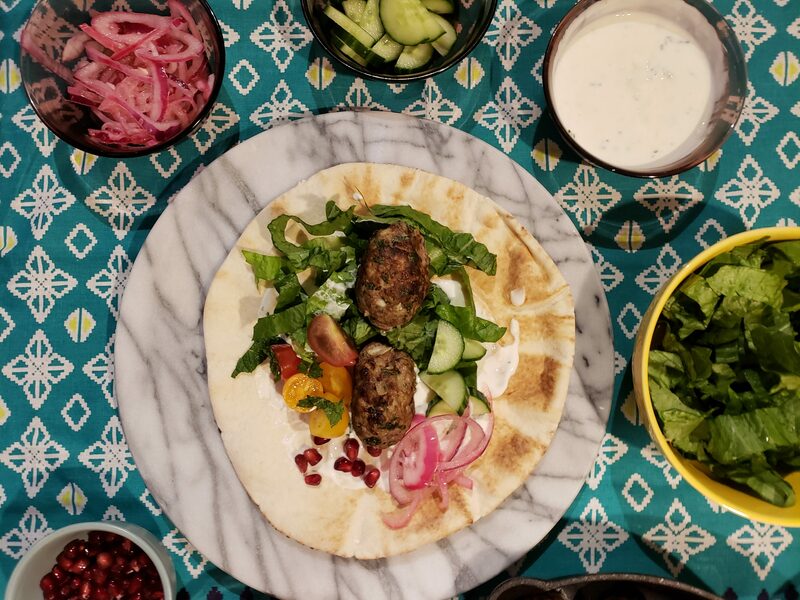 A great middle eastern dish that is so scrumptious and satisfying you’ll have to hold yourself back from overeating. 1. Combine all ingredients except olive oil into a large bowl and roll into sausage shapes. Do not compact the lamb mixture once in the desired shape. 2. Slightly flatten sides and place on a baking sheet lines with cling wrap and place in fridge for 30 minutes. 3. Combine yoghurt, garlic, lemon zest, juice, salt and dried sauce together. 5. Using a large frying pan heat frying pan and cook kofta on medium-high heat for 5 of so minutes each side until cooked all the way through. 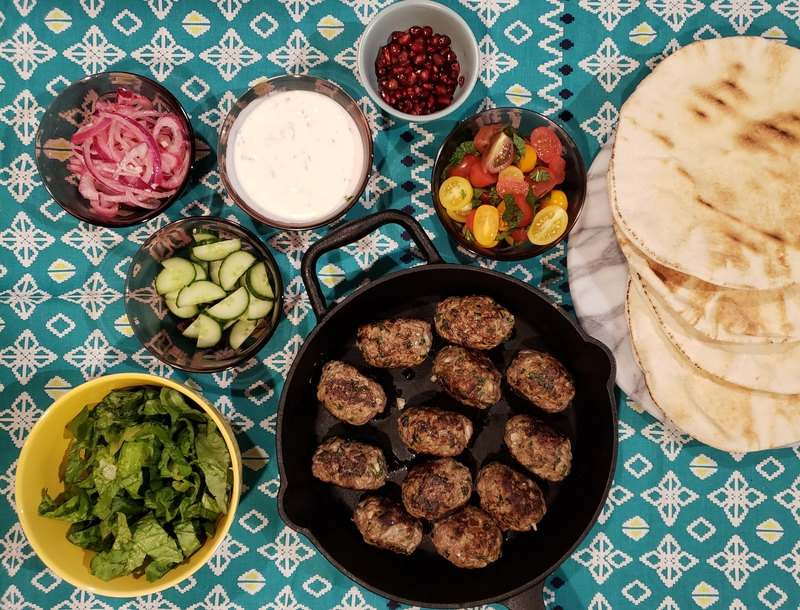 It was great making koftas another way as last time I made them it was a bowl and I quite enjoyed them. I decided to serve mine with cucumber, pomegranates, and pickled onions to bulk up the meal a little. This was a lovely meal; but it was time consuming. It didn’t seem like it would take so long and since there is not times given I didn’t know what I was getting myself into. The directions were a little off, so to achieve the kofta look I was accustomed to I sear all sides and cooked the remaining time in the oven. Almost 2 hours beginning to end. That’s a little long for me on a weekday after getting home for work; but then there is leftovers for the next couple of days. A trade off perhaps? 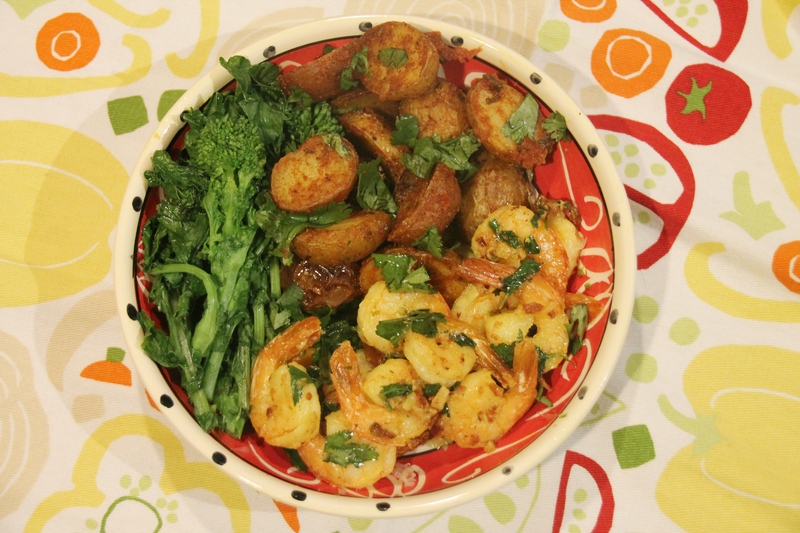 What beats a 5 minute shrimp dinner … nothing. 1. Heat olive oil and butter in a cast iron pan for about 1 ½ minutes over medium-high heat. 2. Once butter has melted add garlic and cook for 30 seconds. 3. Add shrimp and sprinkle with salt, stirring occasionally until opaque about 1 ½ minutes. 4. Pour tequila in and cook until it evaporates, another 1 minute. 5. Turn off heat, add lime zest and juice, and toss. 6. Add cilantro and serve. This was a unique recipe and in theory I thought I would love this. I loved my vodka shrimp; but the tequila shrimp I found slightly bitter; but maybe that was just me. Otherwise I enjoyed the simplicity of the recipe. I served mine with some rapini and my salsa potatoes. 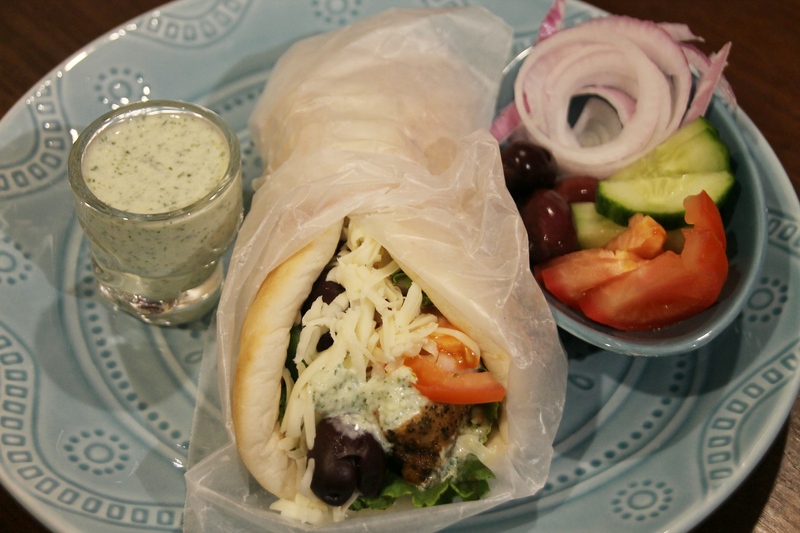 My love of Greek food never fades and yet I have never made chicken souvlaki at home. 1. In a food processor add yoghurt, lemon, garlic, cucumber, sea salt, dill and pepper and blend. 2. Pour into a container and let chill. 1. Make marinade of lemon juice, garlic, oregano, sea salt and black pepper. 2. Cut chicken breasts into cubes and pour marinade over top and place in fridge for 3 hours to marinate. 3. Using a cast iron skillet pour extra virgin olive oil into pan and cook chicken cubes, 3 minutes per side or until cooked through thoroughly. 4. Serve pitas warmed and add toppings along with tzatziki and mozzarella. •	Tzatziki can keep for a few days. This was a messy but delicious meal and I’ve never had a chicken souvlaki that wasn’t messy so I know I did this right. I especially loved the sauce that was extra garlicky and had a wonderful kick. The chicken was moist and succulent. 1. Peel and devein shrimp and place into a bowl. 2. Add soy sauce, garlic cloves, parsley, lime juice and honey and let marinate for 10 minutes. 3. Using a wok over medium heat, heat up the olive oil and add in the leeks, red cabbage and button mushrooms and cook for 5 minutes. 4. Add in the hoisin sauce, salt and black pepper and cook for two more minutes stirring to mix in the hoisin sauce. 5. Using a large frying pan over medium-high heat, cook shrimp until they become a bright pink, turn the shrimp once at three minutes and cook on the other side. 6. Remove shrimp from the heat and add the vodka and return shrimp back to the stove and cook for one more minute until the alcohol smell has dissipated. 7. Serve on top of basmati rice with veggies on the side. 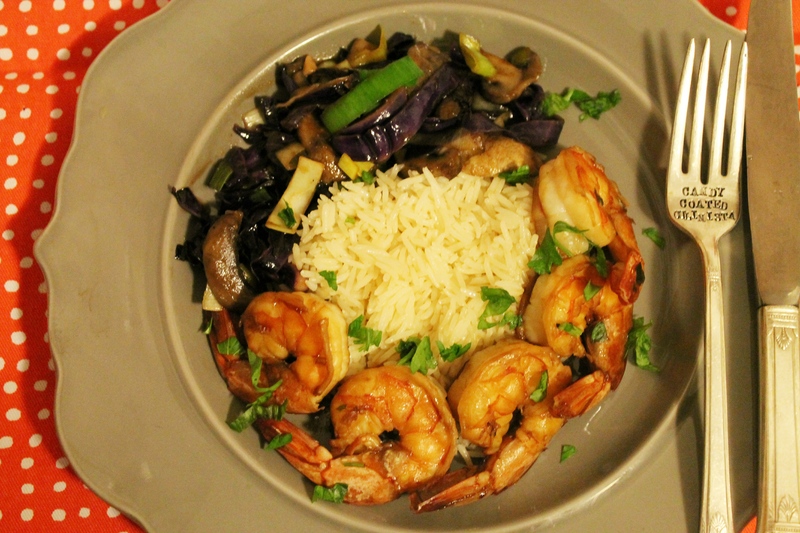 I love the marinade I used on the shrimp as there was a sweet and acidity throughout the dish. 1. Cook the udon noodles according the package then drain and set aside. 2. Using a large saucepan pour in the beef broth and bring to a boil. 3. Add in celery, onion, parsley, green onions, garlic, carrots, ginger, snap peas, mint leaves and let cook for five minutes. 4. Add in the udon noodles along with fish sauce and apple cider vinegar and cook for five more minutes. 5. Turn down the temperature to simmer and add in the bok choy and let cook for 10 more minutes. 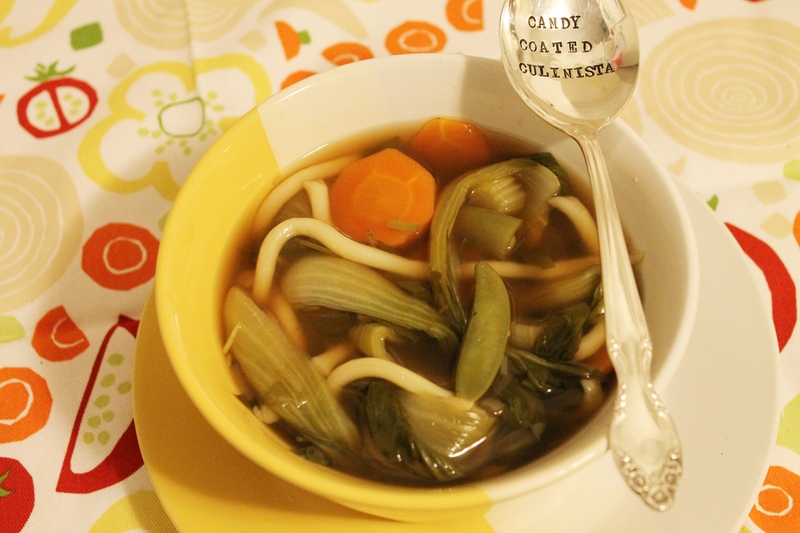 •	Use vegetable broth to make this a vegetarian, vegan dish. I usually love the soup I make; but so far the Asian inspired soups I haven’t really been a fan of. It tasted fine, but just not to my style. You have guests coming over the weekend and you want to make something warm and comforting; but keeping yourself on a budget try this heart-warming soup. 1. Using a medium sized Dutch oven pour olive oil into pot and allow to heat up over medium-high heat. 2. Add onion and garlic and sauté until golden. 3. Place ground beef and pork in and cook until brown adding in sea salt, black pepper, oregano, basil, red chilli flakes. 4. Pour in the crushed tomatoes followed by the vegetable broth and bring to a boil and then reducing to simmer for 10 minutes. 5. Add in the pepperoni slices and lasagna noodles and let the mixture simmer for 25 minutes until cooked. 6. Add spinach and baby kale in the last 5 minutes of cooking. 7. 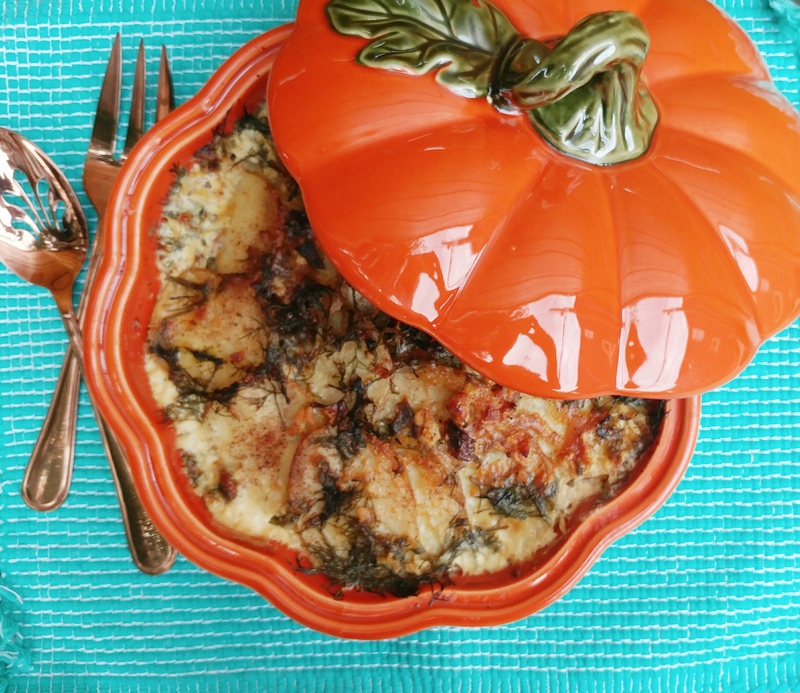 Serve garnished with fresh basil and shredded mozzarella and parmesan cheese. •	Use canned whole tomatoes and blend quickly in a food processor if you are unable to find crushed tomatoes. •	When reheating add more vegetable broth. 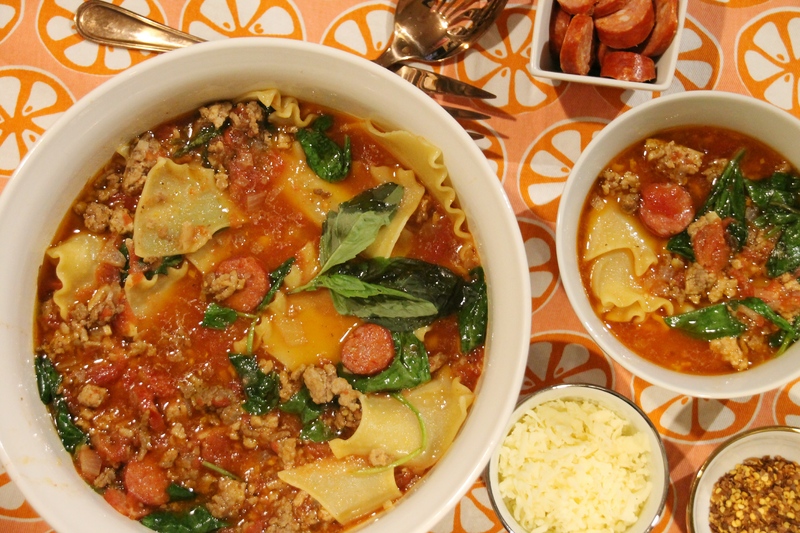 I never thought of making a lasagna soup but I was craving lasagna and didn’t want to do all that work and well we are in the midst of an extreme cold weather warning. So this really hit the spot and everything came together very easily. My taste testers enjoyed and even left with some soup for home. This was surprisingly flavourful and such a great treat on a cold day. I actually made three recipes at once with the same ingredients more or less. I made my Italian Meatballs (a request for me to make), my skillet chicken pepperoni pizza and then the soup. I managed to make 3 recipes for under thirty-five dollars and had about thirteen servings; which was amazing. This was my first bigger meal prep as I don’t really like doing mass meals for the week and I had meals to carry me though some lunches and dinners; which freed up time for me to do things I enjoy like ice skating at night. This Christmas I want to make a complete and composed dinner from beginning to end and who better than to use Jamie Oliver’s Christmas Cookbook. I am practicing these recipes early so Christmas dinner has no hiccups and I am always one to eat Christmas dinner any time of the year; to a few of my friends chagrin. They just don’t understand Christmas in July of Turkey in late spring. I have been adverse to pea soup for as long as I can remember and the only reason was the colour of the soup. I don’t mind peas in any other fashion, so what is my problem right? 2. Using a Dutch oven add in the garlic, onions and leek and celery over medium-high heat with 1 tablespoon of olive oil and cook for 10 to 15 minutes until softened; but not coloured, stirring occasionally. 3. Add in the frozen peas and stock and let boil. 4. Add on a pinch of salt and pepper. 5. Reduce heat to a simmer and let cook for 10 minutes. 1. Lay bread in a large baking sheet and shred ham, apple and crumble chees atop of the bread. 2. Finely grate cheddar cheese over top and drizzle a little extra virgin olive oil and honey. 3. Cook for 10 minutes and then place in soup bowls. 6. Pick out the mint leave and using the immersion blender; blend until smooth. 7. 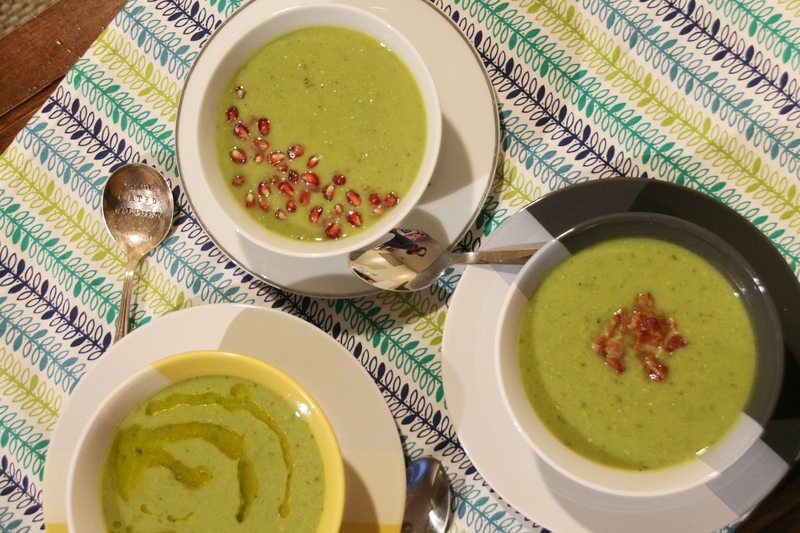 Ladle soup into bowls, drizzle some extra virgin olive oil, add a dollop of yoghurt or crème fraiche, and serve. •	Make ahead and reheat when needed and you can also gather the toast topping and have ready to go. •	Top with pomegranates, crumbled bacon if your not making the toast depending on your guest. Now that I enjoy a daily green smoothie I have no quams about the colour of this soup and I’m very happy I finally decided to try it. The pea soup was so flavourful and my only issue was getting the soup to be silky smooth. Other that that I’m sold. I would suggest using vegetable or mushroom stock instead of chicken and serve the toast, yoghurt or cream fraiche on the side so those vegetarians and vegans can partake. It’s not Christmas without a side of silky smooth mashed potatoes right? Well how about this year you go a little more rustic and complex. Cook Time: 1 hr & 50 min. 1. Peel onions. Potatoes and trim the fennel, reserving the fronds . 2. Finely slice the potatoes, onion and fennel just under ¼” thick, using a mandolin with the guard. 3. Preheat oven to 350°F. 4. In a medium sized saucepan pour milk and cream in and tear anchovies, crush in the unpeel garlic and add rosemary & bay leaves and finely grate in half the nutmeg. 5. Bring mixture to a boil over medium heat and let infuse for a few minutes. 6. Remove out the rosemary and bay leaves and grate in some Parmesan cheese and season if desired. 7. In a baking dish layer the potatoes, onion and fennel. 8. Pour the cream mixture over and finely grate the remaining Parmesan cheese. 9. Cover with aluminum foil and bake for 30 minutes and the remove foil and continue to bake for another 45 minutes, or until tender and golden. 10. Garnish with reserved fennel tops and serve. 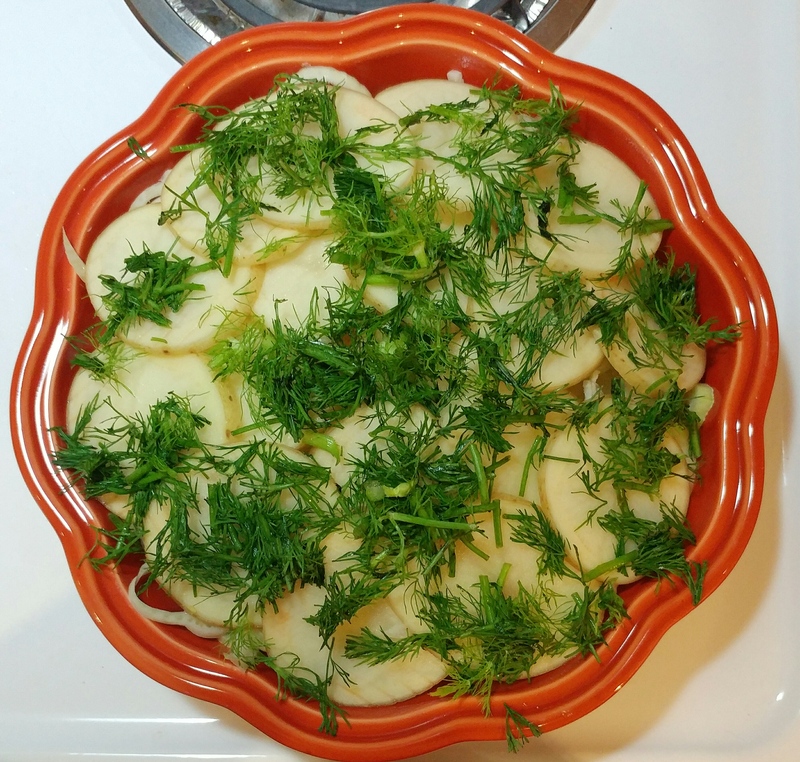 •	Swap out fennel for any other seasonal vegetable such as celery root or celery heart. •	I would also recommend rutabaga as that is easy to find in Canada in the Autumn & winter months. This is a recipe you could prep the night before and cover in the fridge and cook the morning before your Turkey goes in. This recipe was surprisingly savoury and luscious with all the dairy added. I didn’t notice the anchovies; which I actually love; but some of my guests swear they hate. (When they come to my place it’s in lots of things unbeknownst to them and the eat away) This is a amazing and sophisticated side dish that is also great as leftovers. Add some dill to the top also if you have some in the house. We had our first snowfall last Friday and I was pushed head on into soup season a little earlier than I expected. Now I had bought rutabagas and had no clue what to do with them besides my usual preparation and then I thought of adding this to my winter soup. 2. Cut squash in half and scoop out the insides while the oven warms up. 3. Place in a roasting pan and bake for one hour. 4. Prepare rutabagas and sweet potatoes and boil in a medium sized saucepan until tender. 5. Using a frying pan over medium heat pour in olive oil and add onions, garlic and mushrooms; fry until golden brown. 6. 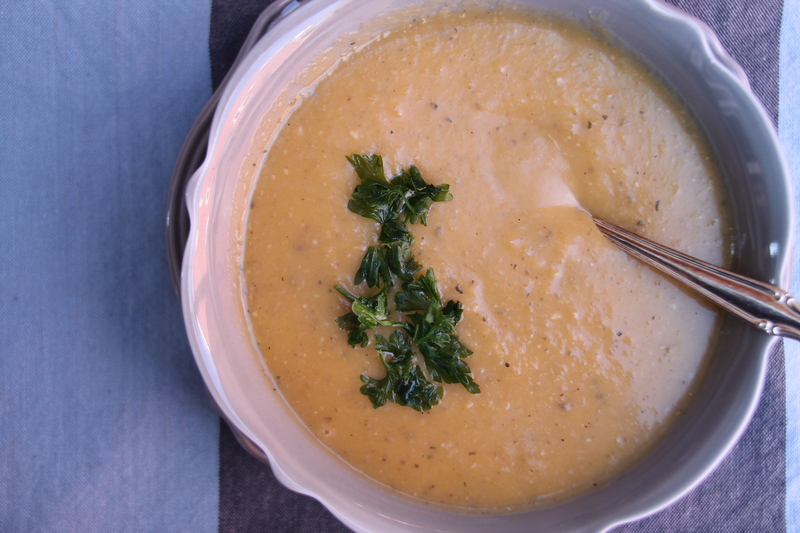 Place rutabagas, squash, sweet potatoes, onions, garlic and mushrooms in a bowl and set aside. 7. Using a large stock pot, pour vegetable stock in and add vegetables. 8. Using the immersion blender, vegetables and let simmer until squash is tender. 9. Once squash is cooked, scoop out of the skin and add to the stock pot. 10. Blend again until all the vegetables & fruit have been pureed and the soup is smooth. 11. Let simmer on low for 45 minutes. 12. Garnish with parsley if desired and serve. •	Use store bought vegetable stock. This turned out much better than I expected as rutabaga has very little flavour. However; with the other vegetables there was an added earthiness I enjoyed. The colour was a little muddier than I’d hoped; but I would have had to add more squash and sweet potato to get my desired colour. 1. Pour chicken stock into a large saucepan over high heat and boil. 2. Once the chicken stock has boiled, turn down to low heat to keep warm. 3. In a medium saucepan heat extra virgin olive oil and pour in the onion and cook for three minutes. 4. Add in the garlic and continue cooking for another 3 minutes until soft and translucent. 5. Stir in one cup of Arborio rice along with sea salt and black pepper stirring constantly for two minutes. 6. Ladle in a half cup of chicken stock to the rice until the liquid is absorbed. 7. Continue adding chicken stock a half cup at a time until rice is tender with a firm centre and the risotto is creamy, about 20 to 22 minutes. 8. Add in the peas and butter in the last 3 minutes of cooking. 9. Stir in the parsley and grate some Parmigiano Reggiano to taste. A slow but well worth it process. 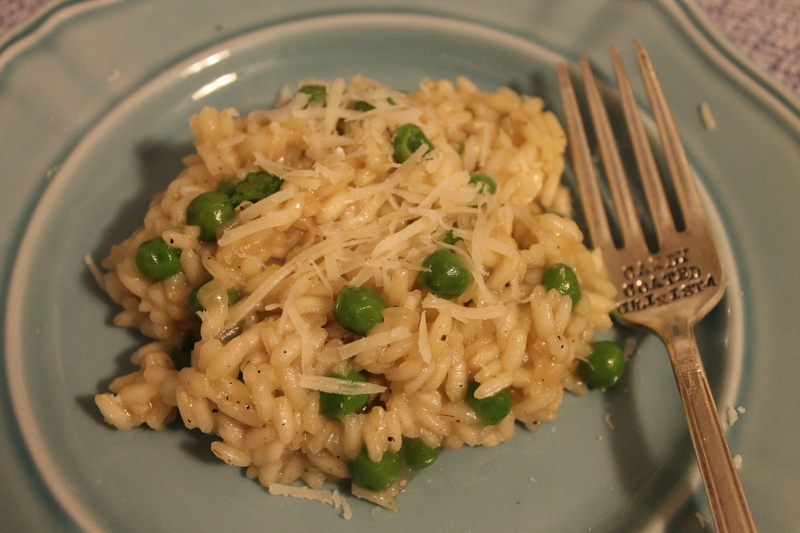 Creamy and aldente with the fresh peas and parsley along with the Parmigiano Reggiano made this a rich dish.